Note: Images were captured without flash and reflect color of dominate light source. 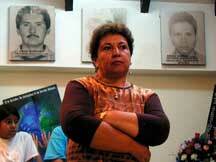 Astrid Mannque is key organizer of ASFADDES, and is the wife of a disappeared, Harvey Ramirez. (Their daughter, Joan, was also present for the meeting.) 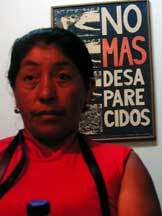 Astrid also belongs to SOMOS, a women's organization consisting of campesinas and indigenous. And she also works closely with political prisoners. "We who are working for justice are not delinquents. Seventeen years ago they disappeared my husband. The struggle is hard and sad but beautiful. Just because they disappeared my husband doesn't mean that I'm going to pull out of the struggle.... This meeting is about social and political prisoners.The San Isidro Prison is the cemetery for living people." ASFADDES started in 1982 when 14 students from the National University were disappeared. 2. pressing for the full search for the victims.The organization is entirely women. We have legal standing comparable to the 501 3C (nonprofit). 3. We also work with the children of the disappeared. They are doubly affected, with the loss of a parent and the breaking of the nucleus of the family. 4. Try to work with self-sustainment so that each region can sustain own work. 5. Psycho-emotional advising for survivors provided by Two Worlds Foundation. a. Every May we have a Gallery of Memory; we retain personal items like a broken shoe. b. This October is 20th anniversary of ASFADDES. Will have big event in Bogota. c. ASFADDES -- With All The Right: this theatrical act demonstrates a family's grief at disappearance. ASFADDES has been declared a military objective by the paras. "We are very afraid, especially we who are in the leadership. We are afraid for our lives." Disappearances have gone up 100% in recent years.That is also true in Cauca. Now the paras are recruiting children to better carry out their campaigns. For a person to be disappeared, they don't have to be a leader. The intent is intimidation. August 31, 2001, 29 people were disappeared in Cauca -- using taxis, buses, and trucks. Law 589 was denounced by a military judge, but we are working for the enforcement of the law, so that we can move forward looking for the disappeared. Amparo. The pictures behind her line the ceiling and are of some of the disappeared. Amparo: The root of her involvement in ASFADDES was the disappearance of her daughter, Nancy del Carmen Apraez, and her grandson, Carlos Alberto, nine years ago. She has worked in this office for 6 years -- both in leadership and in carrying out daily functions. "We welcome all families who have lost loved ones." Denunciations yielded information that the kidnapping was done by the "anti-kidnapping unit" of the state! The anti-kidnapping unit, the gaula, looks for kidnapping victims. Nancy's husband was believed to have information on another kidnapping, and Nancy and son were kidnapped to pressure him for information.The state unit charged with investigating kidnappings will use these abusive practices in their own investigations. The same year that Nancy and Carlos disappeared, Amparo got a call that they would return the grandson (but not the daughter) if Amparo dropped the charges.They had abandoned Carlos Alberto in the street. He was adopted by a Swiss couple, where he still lives. Amparo went through a legal process to annul the adoption and was successful. But by then Carlos had been with the family for four years. Amparo made an agreement with the adoptive parents to allow them to keep him in return for her access to him, but she cannot afford to see him in Europe. After a 3 1/2 year investigation, the perpetrators were found. They had kept Nancy for 8 days, then shot her twice in the head and pushed her over a precipice. Perps were detained -- the nineteen include army and police officers -- and they have sentences of 30-39 years each. After this legal resolution, Amparo began working with ASFADDES -- including some manual projects, such as the flowers with the names and dates of the disappeared. The flowers are sold for 1000 pesos or $.40 each to help mothers raise funds for their children. Judy Oreno; 18 months ago her husband Jaime Castillo and her brother Jose Oreno were disappeared. Amparo was able to get justice for her daughter's murderers because she was able to get it into a civil rather than military court. Judy Oreno: 18 months ago her husband Jaime Castillo and her brother Jose Oreno were disappeared. Case has been archived due to lack of evidence. She feels pretty sure it was the FARC who took them, and she wonders if she could get information via the Red Cross. Maria Carmen: 4 1/2 years ago her husband (Celimo Burbano, taxi driver; 39 years old) was disappeared; he was later found tortured and killed. According to witnesses, the state carried out this act. Another person who was also detained is still missing. One of the perpetrators continues to practice law. "I fear he will continue doing this to people." 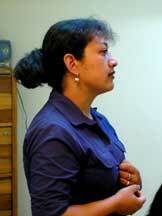 Imensia Majin: Her husband, Angel Mario Gomez Rodriguez, disappeared eight months ago on Dec. 3, 2001. They have been married for 15 years. Nothing is known. "I have spoken to family in Bogota and Caqueta, but there is no news." Ricardina: Husband Maximo Gomez disappeared 8 years ago in Cali. "It is very sad not to have proof, and I cannot go to the attorney general.... It would be helpful to see his body, to see his bones, but instead I just live in this nightmare." Ana Maria: My son and the husband of my niece were disappeared July 31, 2000. Their names are Jose Raul and Wayne Martinez. There is no news. I want to know if there is some way to get information via international organizations. My son, Jose Raul, was good; he worked in a restaurant, and went out to sell the hot sauce that his wife made. He disappeared in Antioquia. Rosita: My father disappeared 10 years ago with three other men; no se nada. My father, Alirio Chamizo, was a community organizer. I have not made a legal demand because my mother is afraid. I am the only daughter. Alba: My son disappeared 18 months ago; I did a denunciation but nothing came of it. I have no information. ASFADDES has helped me by providing psychological treatment. The national level of ASFADDES does not have the resources that they need, with so many widowed who are single heads of households with a real lack of resources. We have to go to other orgs for support. ASFADDES has received a lot of help from Amnesty International on a national level, e.g., with the 43 farmers disappeared by the AUC. Astrid's current dream: to be able to get three computers and copying machines. The state treats the disappeared as if kidnapped, but there is a difference. There are no rights for the disappeared. An anthropology student was recently kidnapped and tortured. He was found and had been so severely tortured that he required surgery; he is now in a mental hospital. Uribe will hit us hard, with greater repression. We NGO's working on human rights must look for ways to protect ourselves. We look to international support, but not Plan Colombia which is worsening the situation. We will see that many new members of the Congress are sympathetic to Uribe and the paras. So we might not see an increase in political prisoners; they might simply disappear more people. Thank-you for accompanying us. "No peace in this country. They [the new government?] don't care for themselves, so they don't care for us."